Twist-to-lock plug configuration, NEMA L5-20P to NEMA L5-20R, UL Listed. Constructed with heavy-duty 12 gauge wire and molded locking male and female connectors. Suitable indoors/outdoors for air compressors, power tools, wet/dry vacs, lawn mowers and more. Use for construction and industrial applications where extra protection and durability are needed. 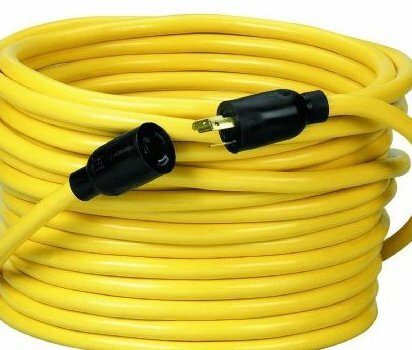 Manufactured with stranded conductors, bright yellow jacket and solid molded plugs for longer life.